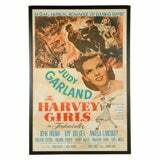 1946s Movie Poster of "The Harvey Girls"
Original US film poster for the 1957 Science fiction movie. 1950s science fiction is populated by monsters and aliens. These fantastic creatures, state of the art in their time, now appear strangely dated, especially on the screen where their limited special effects often produced monsters that were more comical than terrifying. The posters artists free from technological limitations, were able to preserve the full splendour of the script writers weird and wonderful imagination. 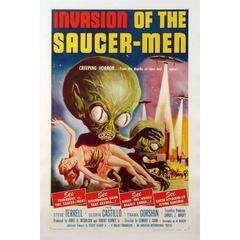 Invasion of the Saucer Men is one of the best examples of the genre. The size given is without the frame. 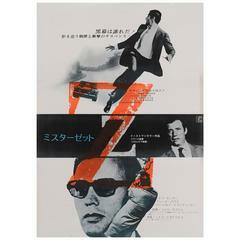 the poster is conservation Paper backed and conservation framed with acid free mounts and UV Plexi-Glass. Original American style B movie poster for Robert Aldrich's 1955 drama staring Jack Palance, IDA Lupino, Rod Steiger. Original US movie poster for the 1963 Sci-Fi, Horror film directed Steve Sekely and starring Howard Keel, Nicole Maurey. Original vintage movie poster "Queen of the Pirates" 1961 starring Gianna Maria Canale and Massimo Serato. 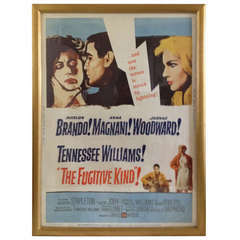 From the home of Paul Newman and Joann Woodward, the 1960s original gilt framed <br /> Movie poster. Original vintage movie poster "The Fountain Of Love" 1968 starring Eddie Arent, Ann Smyrner and Hans Jurgen Baumler. The biggest barest bawdiest romp since Eve started wearing pants! Original vintage classis B-movie poster "Mark of the Witch" 1970 starring Robert Eltson, Anitra Walsh and Darryl Wells.